Lincolnshire CCC travelled to Harpenden to play Hertfordshire in the semi-final of the Unicorns Knockout Trophy. Jonny Tattersall returned to the Lincolnshire side in place of Sam Evison. On a hot day, Lincolnshire won the toss and elected to bat in front of a substantial crowd. Louis Kimber and Jonny Tattersall gave Lincolnshire a great start, putting on 88 for the first wicket before Tattersall was stumped for 39. This stand proved to be Lincolnshire’s highest of the innings. Kimber soon followed being adjudged lbw for 49. Dan Freeman and Matt Lineker were dismissed and at 125-4 Lincolnshire’s early dominance had been halted. Sam Wood and Adam Tillcock then added what was to be a vital 45 before Tillcock was bowled and Wood followed caught on the boundary for a valuable 40. Thereafter only Dominic Brown with 28 not out made any substantial contribution as Lincolnshire were all out for 222 in the last of their allotted 50 overs. Ben Waring, with 7-41, was the home side’s most successful bowler. If Lincolnshire were to win the match they had to make early inroads into the Hertfordshire batting order. This they did to devastating effect. Inside six overs they had reduced the home side to 17-4, Alex Willerton taking three of these wickets and Matt Carter one. 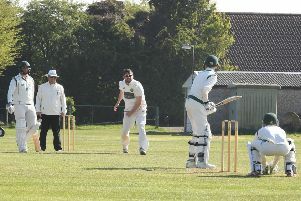 Reece Hussain and captain Frazer then staged a steady recovery from this early collapse as Lincolnshire rang the bowling changes. The spinners came into their own as they gradually regained control and when Adam Tillcock dismissed Hussain for 52 the hosts were 120-7. It was not long before Lincolnshire completed a fine win as Hertfordshire were finally all out for 146 in the 37th over, leaving Lincolnshire victors by 76 runs. Alex Willerton with 4-35 was Lincolnshire’s most successful bowler, with Adam Tillcock’s 3-26 being crucial as the game progressed. This was a fine all round team performance by Lincolnshire and they will now face Berkshire in the final at Wormsley on Wednesday, August 23. Lincolnshire return to the three-day Eastern Division Championship fixtures when they travel to Bedford School to face Bedfordshire commencing on Sunday (11am start).